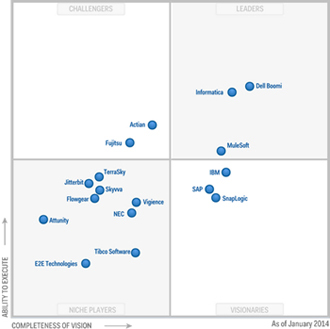 Feb'14: Dell Boomi a leader in the new Gartner Magic Quadrant for IPaaS! We have great news to share! Gartner has positioned Dell Boomi as a Leader in the first-ever Gartner Magic Quadrant for Enterprise Integration Platform as a Service1. First and foremost, we’d like to THANK YOU for your ongoing support of our business, and your extremely valuable feedback on our products, our services and our overall capabilities. Gartner evaluates Enterprise Integration Platform as a Service (iPaaS) providers on two axes: completeness of vision and ability to execute. Your input helps drive our strategy and makes us more effective in supporting your business and your strategic requirements. 1This graphic was published by Gartner, Inc. as part of a larger research document and should be evaluated in the context of the entire document. The Gartner document is available upon request from Dell Boomi. Gartner does not endorse any vendor, product or service depicted in its research publications, and does not advise technology users to select only those vendors with the highest ratings. Gartner research publications consist of the opinions of Gartner's research organization and should not be construed as statements of fact. Gartner disclaims all warranties, expressed or implied, with respect to this research, including any warranties of merchantability or fitness for a particular purpose.